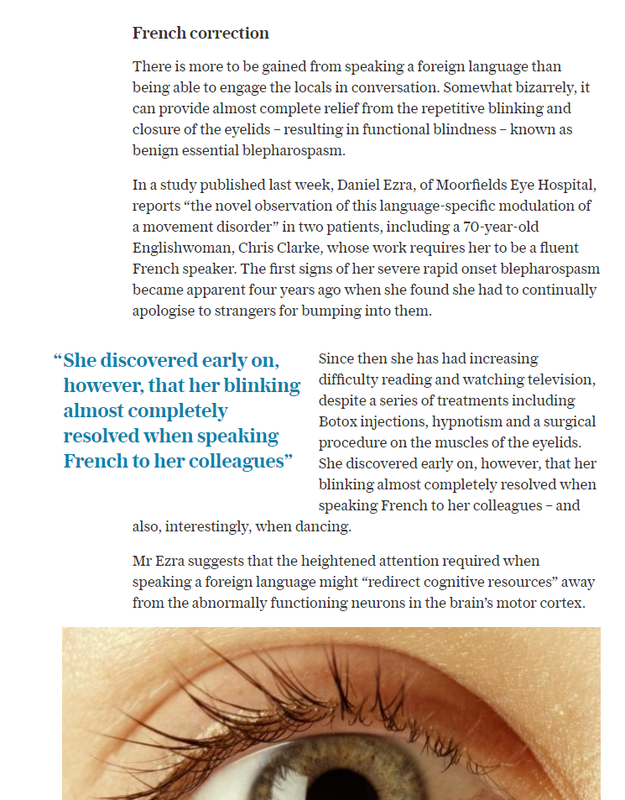 A fascinating new study published in the latest edition of Movements Disorders presents two patient case studies that demonstrate how speaking French as a second language can significantly reduce the symptoms of a life-limiting eye condition, Benign Essential Blepharospasm (BEB). The novel paper, led by Mr Daniel Ezra, consultant specialist ophthalmic surgeon at Moorfields Eye Hospital and his research colleagues at University College London explores this phenomenon for the first time and presents a number of hypotheses. The research has attracted interest from national papers including The Telegraph, The Times and the Sunday Express (see features below). BEB is a focal dystonia causing involuntary contractions of the upper eye lid and upper face. It is an incurable chronic condition, the causes of which are not known, that has a devastating impact on patient’s quality of life. One of the patients in the study was Chris Clarke, a 70 year-old from Hertfordshire, who suffers from severe and rapid BEB. 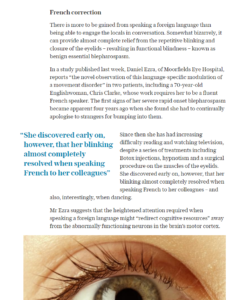 Having spoken French throughout her career, Chris noticed whilst talking to a colleague that her symptoms eased considerably when speaking in this second language, rather than her native English. Chris was getting hardy any response to conventional therapy for BEB (botox) or oral medications, and underwent eyelid surgery. Whilst Chris has seen a significant improvement following surgery, and her confidence in her ability to go out and about independently has been restored, she will need to continue botox treatment every 3-4 months.